Going for long strolls with your dog is one of the perks of having a dog. As a dog parent, walks are an opportunity to see the world through a different perspective, your dog’s perspective. 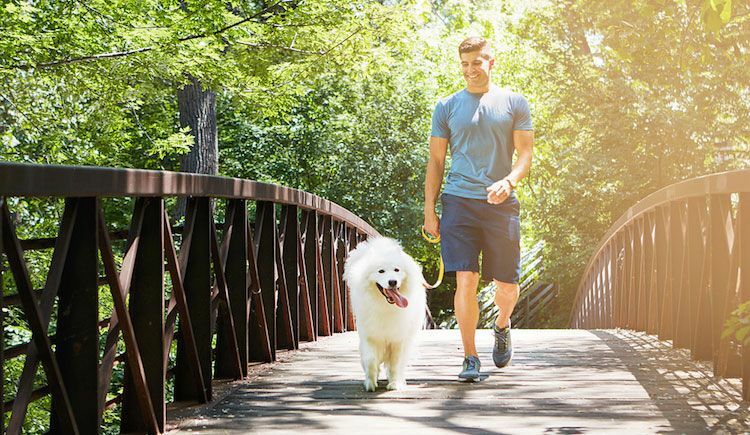 Walks are also beneficial in maintaining a healthy body and a healthy bond between you and your pooch. Hence, taking your dog for a saunter is very important but there is one more thing which very important and that is taking care of your dog’s body and comfort whenever you take him/her for a stroll. Dogs become excited and curious whenever they get to go out in open. And because of that they play and run a lot. They want to know about everything, just like small kids. So, there are chances of your dog overheating his/her body in the summers because of the activities he does. Overheating will cause dehydration, panting and drooling in your dog. Overheating caused due to increased activity levels can be monitored by devices that come as a collar. Activity monitors keep a track on your dog’s activity levels and also serve as a GPS tracker in case he/she gets lost. FitBark is one such activity tracker collar that looks after the activity levels, quality of sleep, distance traveled, calories burned, and overall health and behavior round the clock and 365 days. Activity monitors like these will help you to avoid exhaustion in your dogs in summer. Longtime in the open in summers means dehydration. There are many parks equipped with fountains that are available and accessible to dogs but still don’t rely on parks instead keep drinking water with you to keep your dog hydrated. A hydrated body is a cool body but there is more when it comes to keeping your dog cool. Walking in shade, making sure the ground is not too hot for the paws of your dog, protecting him/her from the sun, and taking breaks in the shade in grass to cool down are also the things that you should do to sustain the body temperature and maintain the coolness of your dog both mentally and physically. Yes, dogs also need sunscreen because dogs that have less fur density, shorter hair, and pink skin are more likely of sunburn because of the sun rays reaching the skin directly. There are many sunscreen creams that come for dogs and one of which is Pet screen Sunscreen SPF23 it protects the skin from all forms of problems that direct exposure to sun rays causes. Senior dogs and overweight dogs have to be taken extra care when you take them for a walk because of many reasons like weaker bones and joints, weaker muscles, body getting heated quickly, less immunity, and less energy. Thus, you need to make a proper schedule and plan to take them for a walk. You can contact your vet and design a walking regime according to their health conditions and needs. Flat faced dogs like English Bulldogs and Pugs have small snouts which make panting and breathing tougher making it difficult to cool down their bodies quickly. Taking frequent breaks and walking in the shades will help them. Summer season is the season of feasts for these parasites because they thrive in a warm climate. In the open, your pooch is an easy host for fleas, ticks, and mosquitoes carrying heartworm larvae. To protect your pooch you need to keep your dog on monthly or a 3 monthly flea and tick treatment program and a monthly heartworm preventive program. Nexgard Spectra is one of the best options because it treats fleas and ticks and also prevents heartworms. Bravecto, Credelio for dogs, Frontline Plus and Heartgard Plus are other reliable options as well. As mentioned above taking your dog for a walk is a gift. And you need to ensure that this gift has only positive outcomes. Don’t forget to have fun while you are out because that is what you are going for. To make the most of those moments with your dog just follow the above-given tips. Let your dog sniff and walk lazily don’t hurry up wait for him/her because that exercise is actually very beneficial for the mental and physical development.